2017 was a period when nearly everything worked for investors. This was most decidedly NOT the case for the first half of 2018. Indexes representing international equities, emerging markets, fixed income, and U.S. value stocks were all down between -2% and -7% for the first half of the year. Despite the widespread difficulties, there were two bright spots in the markets during the first and second quarters of 2018; U.S. small cap stocks and U.S. growth stocks were both up over 7%. Investors’ exposure to these segments likely kept their overall portfolios somewhat afloat. Starting the year, there was much optimism across the investment community. Synchronized world growth, strong corporate earnings, cash balances moving back to the U.S., stock buybacks, and significant tax cuts led us, along with many of our peers, to believe that 2018 could be another fantastic year to have capital at risk. So, what prevented the widely anticipated broad rally? The implementation of trade tariffs against friend and foe alike, a suddenly rising U.S. Dollar, rising interest rates, and overall geopolitical concerns all contributed to the headwinds that negated the tailwinds. The first half of the year was a grind. But, what about the second half? 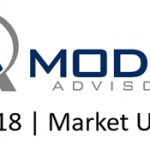 For a variety of reasons, we here at Modus Advisors remain cautiously optimistic about the prospects for the remainder of 2018. We expect strong corporate earnings to continue and we think U.S. growth will continue to clock in higher. The short-term benefits of the tax reductions should become more evident as companies increase their spending and investment. Outside the U.S., developed markets are still growing, albeit at a slower pace than initially expected. Additionally, while emerging markets were hammered in the first half of the year by the tariff talks and the strong U.S. Dollar, tremendous value remains with significant growth in the pipeline. Finally, within fixed income, we expect rates to continue to rise which will remain a negative for the space. However, with higher rates today than a year ago, the resulting increased yield should help cushion further price drops to come. When you put all these together, we think the second half of the year has a good chance to be better than the first. The biggest wildcard remains trade. While we are not fans of tariffs, if the administration is able to improve the U.S. trade position globally through thoughtful negotiations and the trade war dials down, buckle up…that could set markets off to the races. If, however, trade tensions should increase from today’s levels, there could be a domino effect of bad results that could ultimately lead to a recession earlier than anticipated. We will continue to hope for the former, yet be prepared for the latter. * The opinions voiced in this material are for general information only and are not intended to provide specific advice or recommendations for any individual. To determine which investment(s) may be appropriate for you, consult your financial advisor prior to investing. * Past performance of various public indexes discussed in this presentation were gathered from Morningstar. * The economic forecasts set forth in the presentation may not develop as predicted and there can be no guarantee that strategies promoted will be successful. * Investing in stocks is subject to fluctuation such that, upon sale, shares may be worth more or less than the original cost. * International and emerging market investing involves special risks such as currency fluctuation and political stability and may not be suitable for all investors. * Bonds are subject to market and interest rate risk if sold prior to maturity. Bond values will decline as interest rates rise and bonds are subject to availability and change in price. * There is no guarantee that a diversified portfolio will enhance overall returns or outperform a non-diversified portfolio. Diversification does not ensure against market risk.